The surface of a grip top conveyor belt offers superior levels of friction. The base material tends to be made from rigid polyester fabric. This means the grip top belt can easily be welded or vulcanised together. The surface is generally made from polyvinyl chloride (PVC). We carry a range of vulcanising equipment which allows us to be able to joint belts on the machine on side if required. 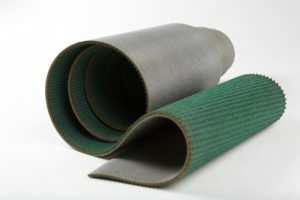 We also have a special impression mat which means the belt texture runs through the joint are. Lots of grip top belting are made endless by supplying them with a mechanical joint. We tend to use Flexco RS125 or RS62 versions or A36 types. A Grip top conveyor belt is generally green in colour, although they can be offered on white. White is usually a special order product. Grip top belts are used on lots of applications that carry a more demanding load. Farming and agriculture are industries where this material can be common place.